Virtual Programming are again delivering on their promises of better performance. 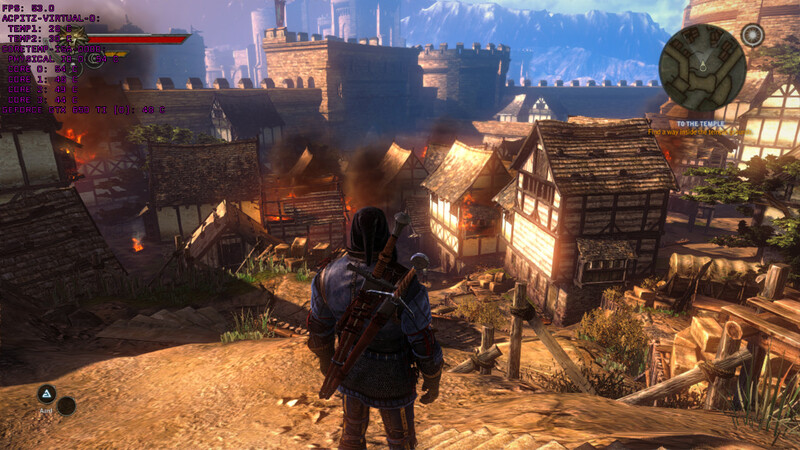 The Witcher 2 has kicked off another round of beta versions and it comes with AMD related fixes too. -Workaround for AMD Catalyst's broken ARB_texture_storage support. We detect Catalyst and disable this extension, for now. AMD have told us that this will be fixed in their next driver release. -Change to memory management - a much smaller "reserve" section is used, and our heap manager now uses regular mmap() allocations. Limited inhouse testing seems to suggest this is more performant and better with large texture loads. A small changelog, but the difference is noteworthy. For one thing AMD actually had broken something in their more recent Catalyst drivers on Linux, so VP have worked around the problem. I want to hear all AMD owners cheer now they can play it on newer drivers. The second change while it may seem small has actually given me around a ~10FPS boost in all tested settings. The Witcher 2 is now perfectly playable on high settings on 1280x720 on an Nvidia 560ti. That's an immense performance difference from the first released version, and we should seriously give credit where it is due here. I am looking forward to more beta goodness to bring on the performance crown. Remember to report any issues that you have on the github here. Keep it coming. Would be great if more and more games keep coming in the easy-way for devs with tools such as EON, Wine...! GoCorinthians Keep it coming. Would be great more games coming in easy-way for devs like EON, Wine! I would not mind if old titles would be brought to us like this. If you're getting 53 FPS with a 560ti I wonder what my 770 will get. Izberion If you're getting 53 FPS with a 560ti I wonder what my 770 will get. Try it on high, 1280x720 with vsync off and let me know what you get. Interested to see. Still well over 60 fps on Ultra on my 860M at 1080p. The eON wrapper works (by now) very well for The Witcher 2, and I would love to see them make one for Morrowind, Oblivion, and Skyrim! The latter two work just fine with Steam For Windows installed using PlayOnLinux, but I'd rather see them in my Linux Steam library. I am very happy now with the performance of The Witcher 2. The game is great BTW. The only problem is that I am getting crashes from time to time, I am using the included self-report tool to report them automatically. How do you see you frame rate?